Port Fairy, a coastal township in western Victoria, is situated about midway between Cape Otway and the South Australian border. It is also the middle one of three harbours along the coast, Portland, Port Fairy and Warrnambool. Port Fairy was named after a small boat ‘Fairy’, captained by James Wishart, which entered the port and probably the River Moyne during a whaling reconnaissance. Popular accounts have put the date of the event at 1810, but surviving primary evidence and general knowledge of Bass Strait whaling and sealing activity strongly support a date of 1828-29. Apart from pastoral activity, farming and sealing or whaling camps, mainly on Griffith Island at the mouth of the Moyne, the first substantial European occupation came with Atkinson’s Special Survey (eight square miles) east of the river and adjoining the coast in 1843. Atkinson privately surveyed a township in 1846, the street boundaries (Regent, College and Campbell) being the boundaries of the old Port Fairy township area. The town was named Belfast, the river the Moyne (both Irish names, from Atkinson’s birth place) but the harbour was known as Port Fairy. The survey included land grants for religious groups, colonial government facilities, an asylum and immigration barracks. Atkinson’s survey (1843) seems to have instantly attracted villagers, as upon the making of the town survey Anglican and Catholic chapels were constructed and there were bluestone stores at the wharf. Parts of the Caledonian and Merrijig hotels date from 1844, or possibly earlier. By 1847 there were also Wesleyan and Presbyterian churches, and all four conducted schools during the 1850s. (The Anglican school, representing the most populous denomination, ran until 1873 when it was replaced by a government school. The Anglican building (1856) is the grandest of Port Fairy’s churches). By 1853 Belfast had over 1000 people, with an active farming community based on the fertile river flats and volcanic soils from Tower Hill. Their produce kept the wharf busy. 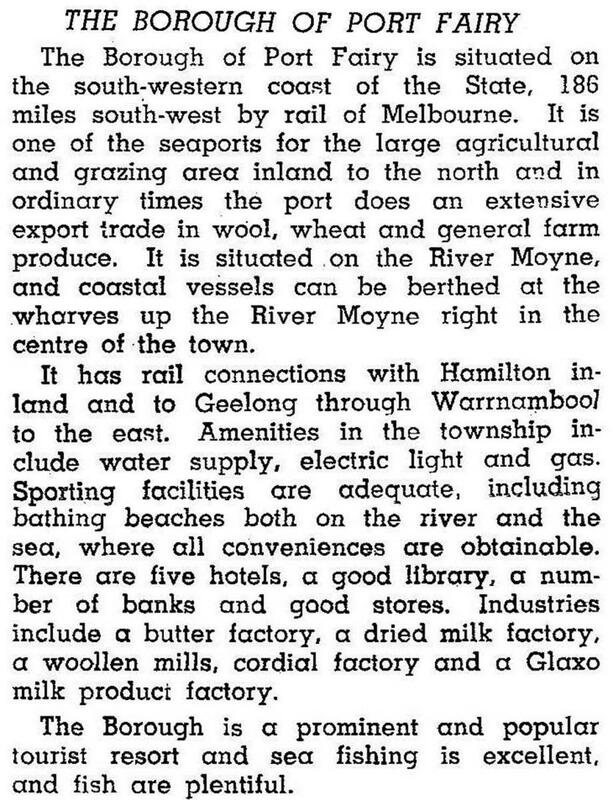 On 29 June 1853, the Belfast Road District was proclaimed, the first municipal body outside Melbourne and Geelong and predating Warrnambool’s by a year. After the disruption of the gold rushes in the early 1850s substantial and permanent building occurred during 1855-60. Included were the court house (1858), Anglican, Wesleyan and Presbyterian churches, banks and additional hotels. In 1865, when Belfast’s population had stabilised at about 2400 people, Bailliere’s Victorian gazetteer recorded borough and shire halls, a mechanics’ institute (1864), a hospital (1855), several good wharves, two newspapers and cricket and turf clubs. In 1856 the town area was proclaimed a separate municipality, becoming Belfast borough in 1863. Belfast shire, successor to the road district, was also proclaimed in 1863. Belfast borough was renamed Port Fairy on 27 May 1887. The 1871 census (2485 people) was Port Fairy’s peak population in the nineteenth century. There was a loss of 700 people within ten years and a figure of 2000 was barely recovered by 1900. The town’s shrinkage helps explain how such a large proportion of its built heritage has been preserved, an augury of its tourist potential one hundred years later. The Council acquired a large coastal dune area, south of the town in 1890, the year the railway reached Port Fairy. This public land, named Southcombe Park, was also to prove a wise move in one hundred years’ time. During Port Fairy’s years of decline and slow regrowth a change in religious affiliation occurred, with the Catholic proportion increasing in keeping with the stronger Catholic tradition around Koroit, Tower Hill and Killarney. The harbour was exposed to south-easterly weather when the sheltered mouth of the Moyne River was blocked by a sandbar. Although the bar was removed in the 1870s port activity had passed to Portland and Warrnambool, and the Moyne wharves had since been the province of a local fishing fleet. A substitute industry in dairying came in the 1880s, and a Glaxo milk product factory became an important local employer. In the early 1970s Port Fairy’s picturesque historic landscape began to be recognised. Some early cottages, termed whalers’ cottages but dating from the end of whaling, were restored for public inspection. Notable public buildings were documented. In 1977 the first Port Fairy Folk Festival was held, using the large Southcombe Park as venue and camping area. It has since become the town’s largest single source of non-local income. A heritage trail was marked out by the local historical society. Earle’s history of Port Fairy (1896) was republished in 1973 and local historian, J. Powling, published his work in 1980, correcting numerous Earle errors. The year of the first folk festival coincided with the closure of the railway from Koroit. The line came south, crossing the Princes Highway at the Glaxo factory, and came to the railway station beside Railway Place, just north of Bank Street. A short way from the former station there is a bridge across the Moyne River to the botanic garden (1858). Its area is 9 hectares, but over half is used for camping. There are nevertheless some mature trees and an attractive bandstand. Port Fairy’s population has grown since the 1980s and its median house prices shot up. It has retained its hospital. Port Fairy has the large Southcombe Park and Griffith Island reserve which is a mutton bird sanctuary. On the neck of land between the river and Port Fairy Bay there are Battery Hill (a former coastal defence) and Seacombe Park, the latter with camping and caravan facilities (over 700 sites). A showground is to the west of the town. There are five churches, a Catholic school and a consolidated State school (227 pupils in 2014). The main shopping area is in Sackville and Bank Streets and the Moyne Shire offices are one block east. There are five motels, two hotels and at least 15 bed and breakfast places (the largest is the former Merrijig Inn). A history centre and museum in the old court house and tourist information centre provide copious local information. Over half of the town on its eastern side is a conservation area in the National Estate Register. Over 20 features/buildings are separately registered, including cottages, churches and the customs house. Plans were released in 2014 for a two storey building on the Port Fairy wharf. A residential subdivision of 24 lots on the Powling Street wetlands, an important habitat of the threatened Japanese migratory bird, the Latham's snipe, was approved the same year. On 23 September 1994, Port Fairy borough was united with Belfast and Minhamite shires, most of Mortlake and Warrnambool shires and part of Dundas and Mount Rouse shires to form Moyne Shire.